Researchers have long observed substantial geographic variation in the use of health care services. This column uses data on health care use among individuals who are uninsured as they approach age 65 and become eligible for Medicare to argue that most geographic variation is the result of supply-side factors that allow providers to exercise discretion over the levels of care provided. Policies aimed at reducing these discrepancies across regions may not only ‘bend the cost curve’, but may also directly reduce health risks arising from individuals receiving ineffective or unneccesary health care services. For nearly a century, researchers have observed substantial geographic variation in the use of health care services. For example, a pre-WWII study of tonsillectomy rates among children in the UK found that the incidence of the procedure varied by as much as a factor of 20 in the greater London area alone (Glover 1938). In recent decades, researchers in the US associated with the Dartmouth Atlas of Health Care project have documented extensive regional variation in the use of health services among Medicare beneficiaries, ranging from hip replacements to routine imaging to end-of-life cancer care. Differential use of such services is associated with regional variation in spending per Medicare beneficiary of as much as 100% (Fisher et al. 2009). Whether geographic variation in health care use is indicative of inefficient resource allocation depends on its underlying causes, which are disputed. If greater use of health care services arises because of differences in population health or patient demand across regions, then there would be little cause for concern. However, if such differences are driven by the supply side of the health care market, for example due to a fee for service payment system or poor coordination of care between providers, then efforts to reduce regional variation wouldbe justified. In a recent study, we provide new evidence on the root cause of geographic variation in health care spending by studying health care use among individuals who are uninsured as they approach age 65 and become eligible for Medicare (Callison et al. 2018). We observe these individuals over several years, allowing us to measure changes in the use of health care services by the same person before and after they are covered by Medicare. We expect that if supply-side factors cause greater use of health care services, then among similar uninsured persons gaining Medicare coverage, those residing in regions with higher past Medicare spending will exhibit a larger increase in use than those residing in regions with lower past Medicare spending. Conversely, if geographic variation reflects differences in patient preferences or need that is clinically justified, then similar uninsured persons gaining Medicare insurance should exhibit no difference in the use of health care services across high- and low-spending regions. Our approach is motivated by a theoretical model in which a patient’s health care provider has the ability to set the price and level of treatment, but is constrained by the presence of other providers in the area (McGuire 2000). Both the patient and her preferred provider know the potential benefit offered by her next-best provider option. Thus, the provider may increase the price or quantity of treatment according to financial or other incentives, but the patient may opt to switch to a different provider if the benefit from the current provider’s offer of treatment falls below that of her next-best option. We assume that the magnitude of these differences in benefits vary across regions for historical or economic reasons. The model has a few key predictions that can be tested. First, for an uninsured patient who faces the full cost of treatment, the provider will offer the optimal quantity of care (where the marginal benefit of treatment equals the marginal cost of providing it) but will charge the highest price that will not lead to the patient switching providers. But when a consumer is insured under a system that sets fixed prices for health care treatments (as is the case in the Medicare insurance programme), the provider will resort to increasing the quantity of care provided up to the point that will not lead to the consumer switching providers. Thus, a consumer transitioning from no insurance coverage to Medicare insurance coverage will experience larger increases in health care utilisation in areas where the benefit from her next-best option for treatment is lower. To test this hypothesis, we compare changes in health care use among uninsured persons who, after turning 65, gain Medicare coverage across places with higher and lower levels of past Medicare spending. We assume that greater Medicare spending in an area is an indicator for consumers having fewer alternative provider options, implying that providers have a greater ability to influence the level of care. Data for our analysis come from the Health and Retirement Survey (HRS). The HRS follows groups of older adults over time, surveying them every two years on their use of hospital visits, doctor visits, outpatient surgeries, prescription medication use, new diagnoses, and self-reported health. We compare the utilisation of an HRS respondent with Medicare coverage at ages 67 or 68 to her own previous utilisation when she was uninsured at ages 63 or 64 and observe how these changes differ across regions with higher and lower levels of past Medicare spending. Comparing a person’s health care use only to their own past health care use allows us to account for permanent, individual differences in the demand for health care. We also account for time-varying characteristics of people measured in the HRS, such as marital status and household wealth, that are correlated with the demand for health care. Notes: The red and green bars represent the sum of the estimated difference and the mean of the outcome in the lowest tercile. The whiskers display the 95% confidence intervals for each estimate (equal to the difference between the red (or green) bar and the blue bar). Figure 1 summarises the estimated differences in five measures of health care utilisation across regions grouped into low, medium, and high terciles of per-capita Medicare spending. For each outcome, the blue bar shows the percentage of patients reporting the indicated outcome in the lowest spending tercile. 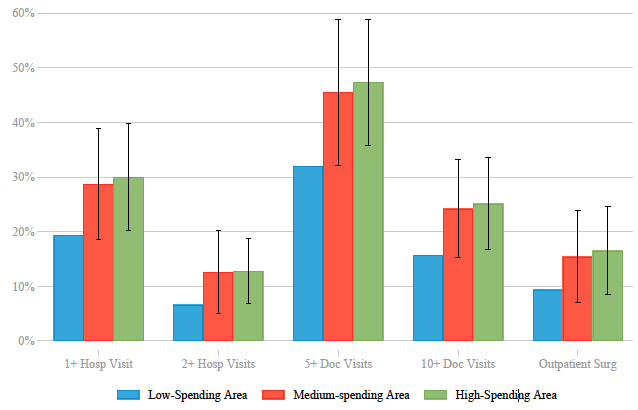 The red bar shows the estimated level in the middle spending tercile relative to the lowest-spending tercile and the green bar shows the estimated level in the highest spending tercile relative to the lowest-spending tercile. We estimate that gaining Medicare coverage in a region in the highest-spending tercile relative a region in the lowest-spending tercile causes a 55% increase in the incidence of one or more hospitals visits, a 93% increase in the incidence of two or more hospital visits, a 48% increase in the incidence of 5 or more doctor visits, a 60% increase in the incidence of 10 or more doctor visits, and a 76% increase in the probability of one or more outpatient surgeries relative to individuals who gain Medicare coverage in the lowest spending tercile. We test for the possibility that our results reflect other unmeasured factors – for example, that the health of persons in low-spending regions is simply better than the health of persons in high-spending regions – by conducting the same analysis using samples of people who did not experience a change in insurance status. First, we compare health care use for individuals at ages 59/60 and 63/64, when they were not eligible for Medicare. Second, we compare people at the ages 67/68 and 71/72 when they were always covered by Medicare. In both analyses we expect no differential change in health care use associated with regional differences in Medicare spending, since here we are simply estimating the effect of growing older in these areas with no change in insurance status, and that is what we find. The results of our study suggest that most geographic variation in health care use is not clinically justified, but is the result of supply-side factors that allow providers to exercise discretion over the levels of care provided. Therefore, there exists considerable scope for policies aimed at reducing these discrepancies across regions. Importantly, such policies may not only ‘bend the cost curve’, but may also directly reduce health risks arising from individuals receiving ineffective or unneccesary health care services. Glover, J A (1938), “The Incidence of Tonsillectomy in School Children,” Proceedings of the Royal Society of Medicine 31(10): 1219-1236. Callison, K, R Kaestner, and J Ward (2018), “A Test of Supply-side Explanations of Geographic Variation in Health Care Use,” NBER Working Paper 25037. Fisher, E, D Goodman, J Skinnner, and K Bronner (2009), “Health Care Spending, Quality, and Outcomes: More Isn’t Always Better,” A Dartmouth Atlas Project Topic Brief. McGuire, T G (2000), “Physician Agency,” Handbook of Health Economics, Vol. 1A: 461-536.